This is the third journal I received from Amber Lotus Publishing, and all I can say is this remarkable little publishing house never fails to impress. Yoga Shatki Journal is a hard cover, spiral bound journal with lots of wonderful well lined blank pages as well as text for doing various shatki yoga poses. The poses are easy to do, fun and most people who do yoga will be familiar with, like down dog and triangle pose. And there are other poses that I enjoyed as well such as the mountain brook pose which is a modified version of the corpse pose. Rappaport also provides brief teachings on subjects such as the om mantra and the Anjali mudra. Her teachings are clear, concise, but packed with wisdom and information that the reader can immediately put into practice. The journal is illustrated by Anja Borgstrom and is done in colored pencils over watercolor. They depict various yoga poses, and despite their simplicity, they are both lovely and functional as they do illustrate the postures quite well. There is plenty of paper in this journal and is well lined, which is a huge plus for those of us who don’t see well, and the reader is able to use this journal to either write out whatever inspires her, or to use as an exercise journal. I use mine for journaling my daily exercise and yoga routines. I find it really comes in handy on days I have to make doctor visits. 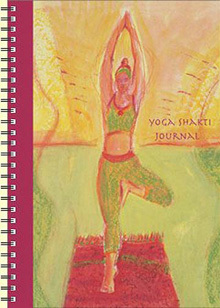 Again, I love Amber Lotus products, and Yoga Shatki Journal is just another example of their wonderful journals. They also have numerous other goodies as well and I highly recommend making a quick trip to their website and browse. I know I’ll be going back soon. Our other reviews are here and here.